Around this part of the country it seems like Holiday weekends bring out the big garage sales. I ran across some good ones today. Won’t this make the perfect potting bench? I saw a table similar to this in an antique store for $35.00, but I nabbed this one for $5.00. 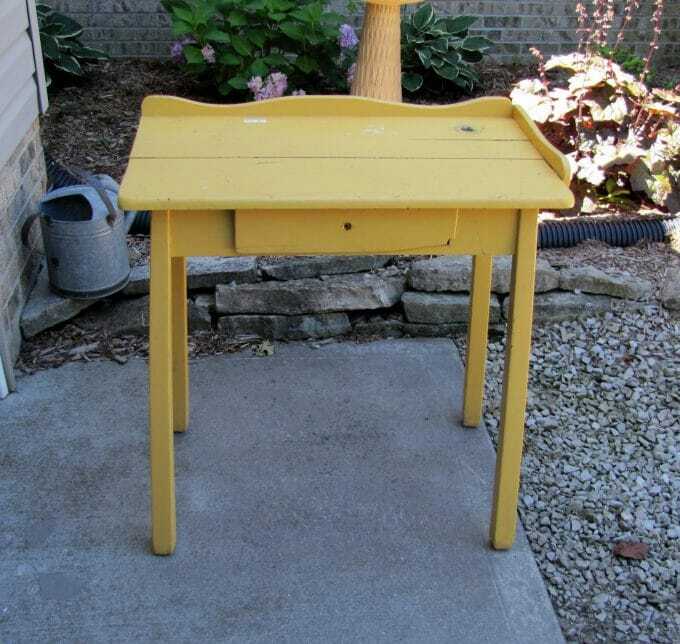 I have to put a pull on the drawer, but other than that it is sturdy – any very very yellow. It has a strange top to it with a lip on the back and right hand side, but not on the left hand side. Up close you can tell it never had one of the left hand side at all, so maybe it used to sit up against something on that side. At the same sale I found this chair for $2.00 and you just can’t pass up a $2.00 chair. 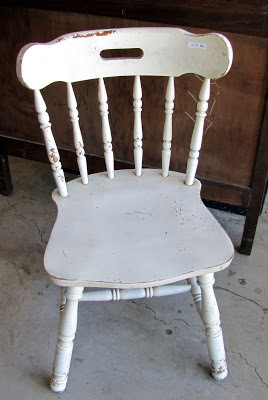 It’s one of those typical 70’s wooden kitchen chairs that someone painted off-white, but I loved the chippy paint. I went to another sale where they didn’t have a single item priced. This is big pet peeve of mine. If you want people to buy something, take the time to price your stuff!!! Anyhow, I saw two fans and asked the lady how much she wanted for them. She said $5.00 FOR ALL THREE OF THEM. I hadn’t even seen a third fan at that point, but who cares, I would have paid $5.00 for just one. This is the second fan. I didn’t realize until I got it home that it has a broken blade :(. 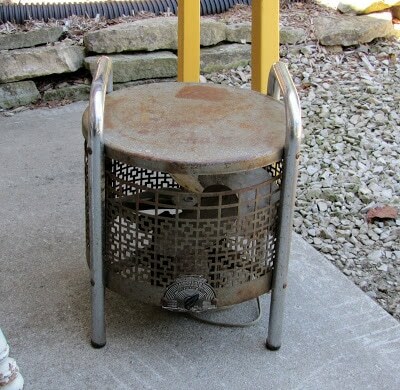 This is the bonus fan that I hadn’t seen, mainly because it looks like a stool. I have never seen a fan like this before. Are you supposed to sit on it while it is running? And if so, are you worried about electrocution or getting your pants caught in the blade? 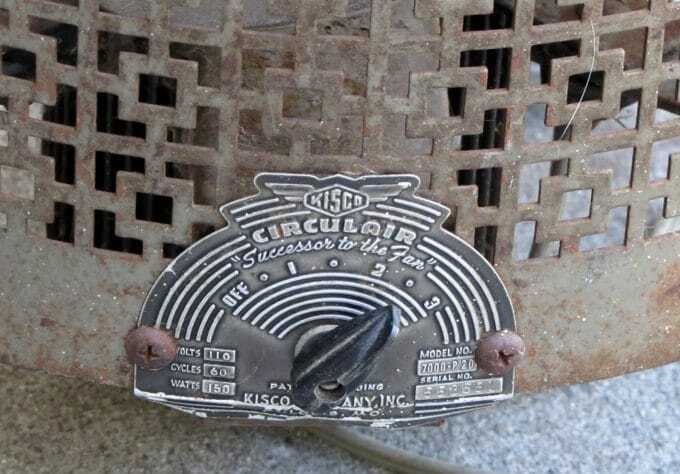 OK, I just googled Kisco Circulair and people are calling it a hassock fan. And on ebay there is one listed that is going for over $30.00 so far. Cha Ching! I bought this cute china bowl for $1.00. I can not for the life of me get a good photo of it though – it is actually cuter in person than this photo. And Baldy the eagle was $2.00. 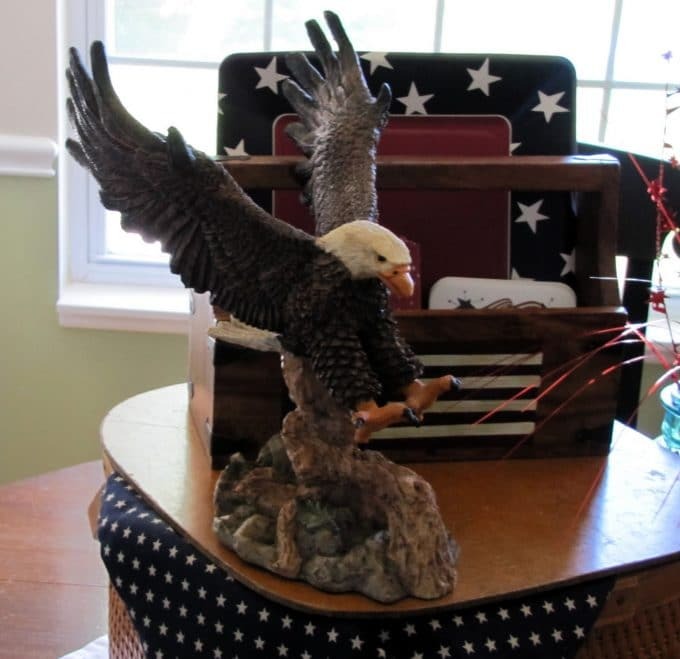 Totally an impulse buy because it was 4th of July weekend, because I have absolutely no place in my home for him any other time of the year unless eagles become the hot decorating item for 2010. Now on to the guy stuff that I know you’ve all been waiting for. The first sale I stopped at had an air compressor for $25.00. A girl can’t have enough air compressors you know. Actually, we already have a larger one, so this is going to a guy in my husband’s office that had been looking for one. 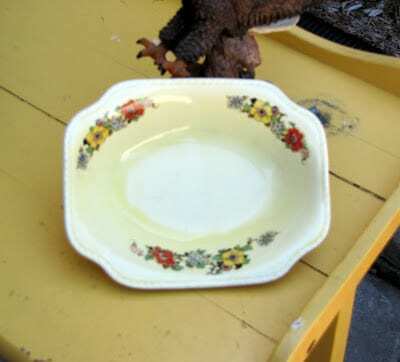 The guy at the garage sale and I lifted it into the back of my van (I have the grease marks on my shirt to prove it) and it will stay there until someone helps me take it out. It has to weigh well over 100 pounds. And a MIG Welder. 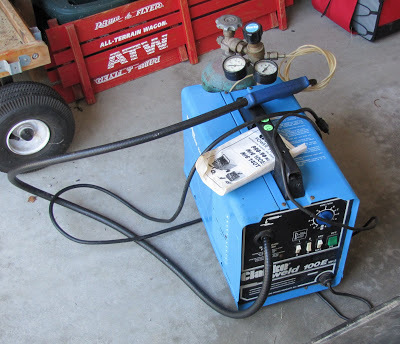 MIG stands for metal inert gas (I googled that for you) and you can do some sort of welding with it. My husband thought it was a good deal at $100.00. All I know is that he was eating up my garage sale money and I had to go to the bank to replenish my cash. 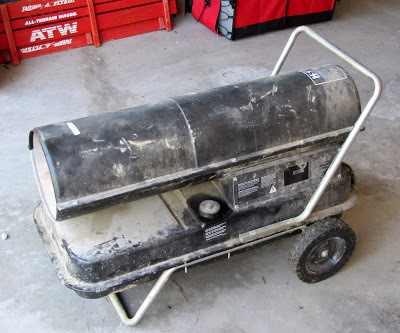 And last but not least we bought a heater for the garage for $31.00. 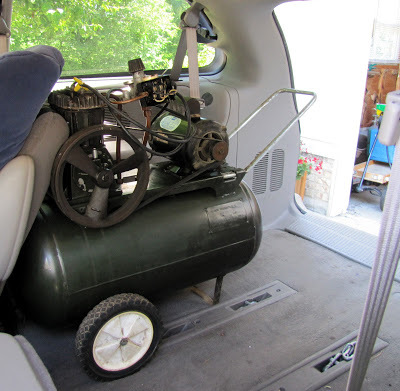 It runs off kerosene and puts out 150,000 BTU. 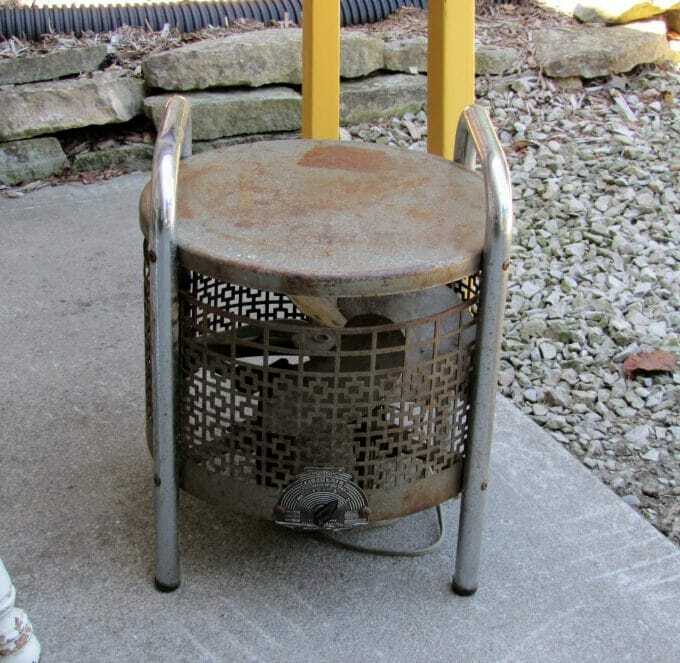 It gets cold here in the winter, so if my husband wants to work on stuff in his garage he needs extra heat. Wonderful finds@ I love the table and the chair! The fans were a great buy! My Hubby would have jumped at those also! What fun finds! I passed up the same bowl after work at SA. Too high priced. I know, I know, it’s for a good cause but I was feeling stingy. Maybe a corner table for two?? 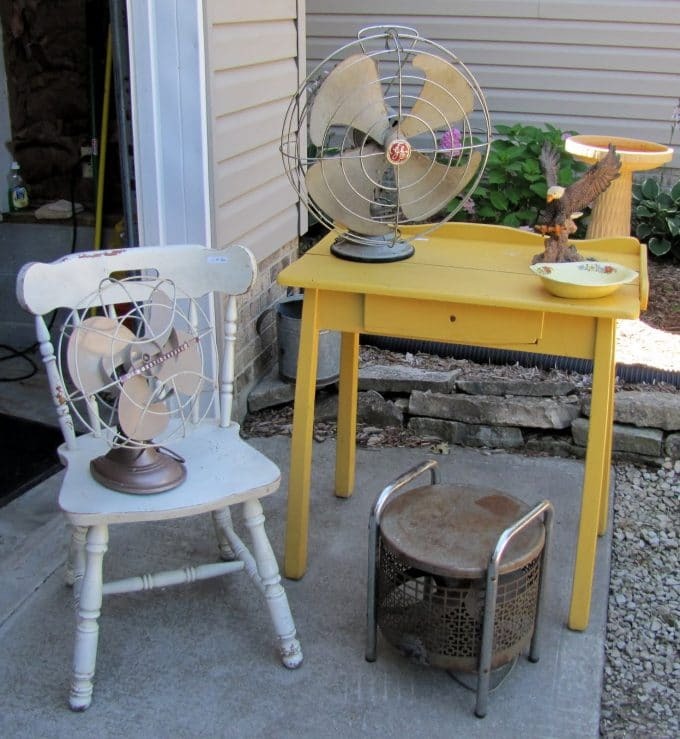 Love the table, the chairs and those vintage fans are fantastic!! Those fans sure were a steal. I love that table. Fantastic finds on those fans! I just passed on a set of Eskimo turquoise fans for $30.00 for the two at an Estate sale last week. I love the look of these even more! 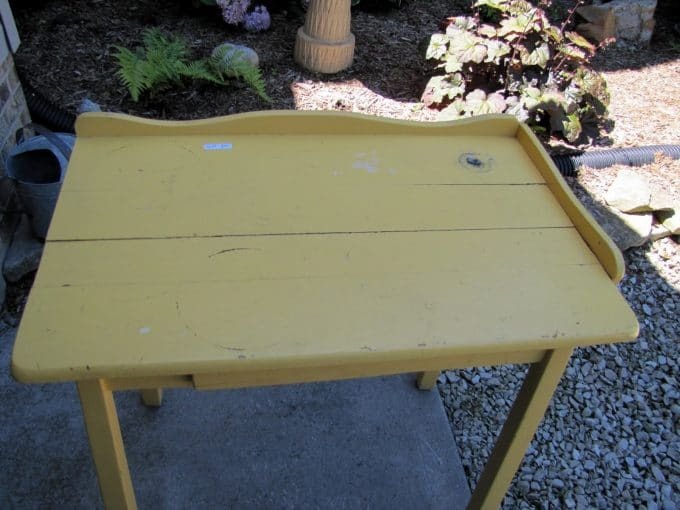 Yellow table is darling, can’t wait to see it in it’s new life as a potting table. OK, with the exception of the welder and air compressor, I would love everything you bought! The fans are to die for, especially that odd sit on one, and your comments are so funny. Great scores! Those fans are really neat! I love the yellow table, too! Fantastic finds. I adore that table and the chair. I agree, the table would be perfect for potting. Great finds! I so love that table! 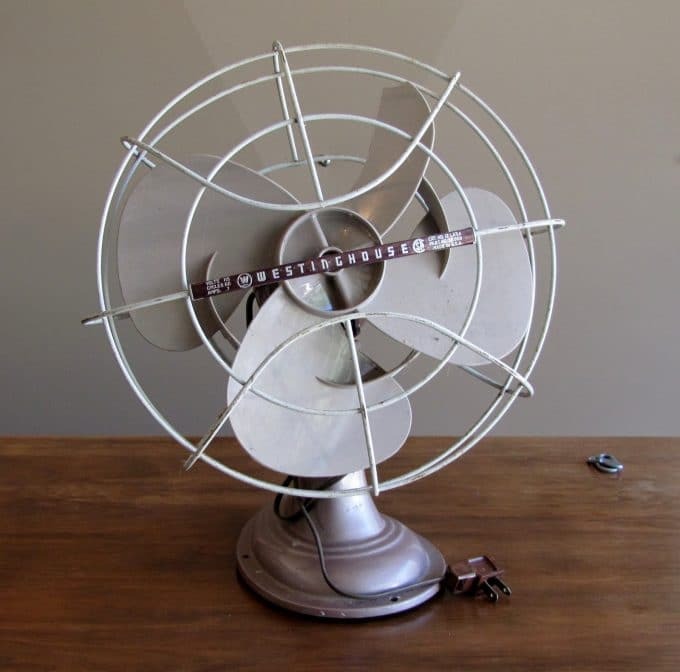 I, too, love vintage fans and found one a few weeks back, too- for $3! 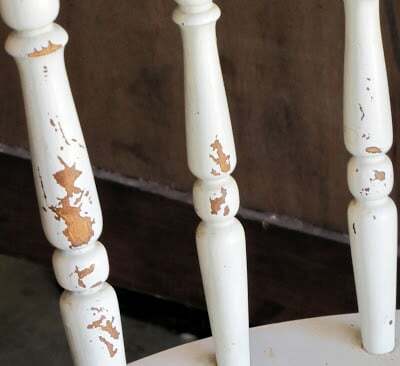 Isn’t it fun finding out about items that were used “way back when”? Thank God for Google! 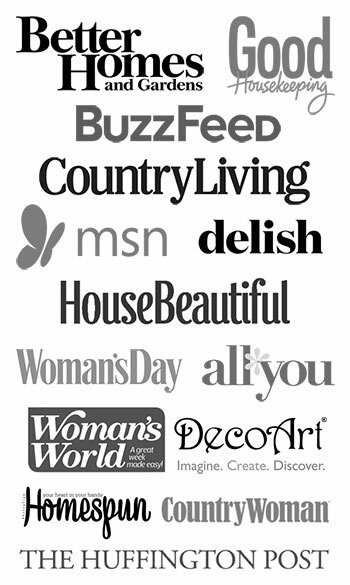 And eBay! Are you gonna sell the hassock fan? I go garage salen with my hubby, also! Oh, well, he is the one who I hand all the pile of goodies to, when I’m ready to pay, and he gets us all the fabulous deals! Have fun out and about with your hubby, too! Great finds! I especially like the yellow table and china dish. Ohhh, love the little yellow table… and that fan? NICE!!!!! 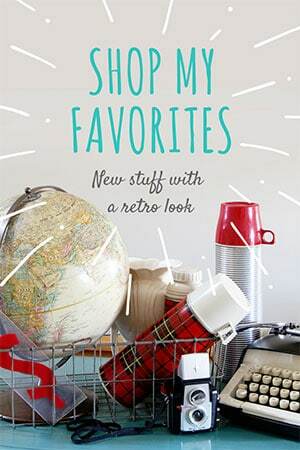 Love all your great finds! 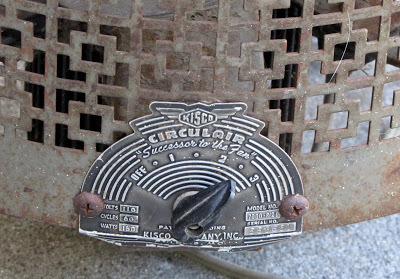 I am completely curious what you are going to do with the Hassock Fan? I would be spray painting that baby and using it as a hassock/footstool. It has such character! 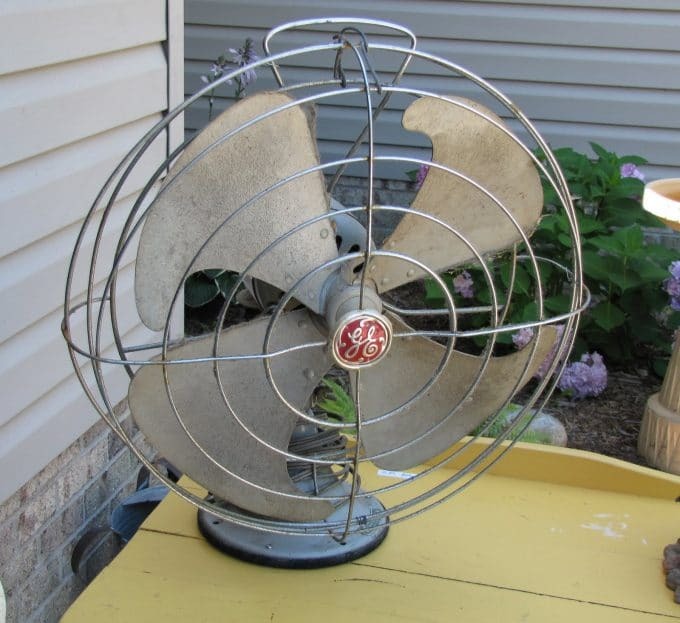 Now I need to add “vintage fan” to my list for yard saling!